Advanced platforms for microbial education and research in the "Twilight Zone"
In this 6-minute activity, players ‘discover’ unusual microbes living underneath the seafloor. After identifying them in the lab, they help each species back to its correct habitat so that it can survive and reproduce. In the process, players are introduced to some of the challenges of subseafloor life; they learn about four generalized habitats in the deep biosphere; they meet appealing microbe species and learn about their surprising chemical activities. At the end, users journey under the sea floor to see the microbes in their habitats and learn why these discoveries are so exciting and important. The science-based game appeals to kids and adults visually, and introduces them easily and entertainingly to stories about life in the deep biosphere. Deep Dark Life is part of the traveling exhibition, In Search of Earth’s Secrets (www.insearchofearthssecrets.com ), sponsored by the National Science Foundation’s Advancing Informal Science Learning (AISL) program and centered on many Earth science concepts explored by the International Ocean Discovery Program (IODP). The game is aimed at 6th grade through adult audiences, specifically targeting underserved, rural and female users, with a choice of English or Spanish subtitles. The game will be available for download by students, teachers and the public at joidesresolution.org and other websites selected by CDEBI and IODP. 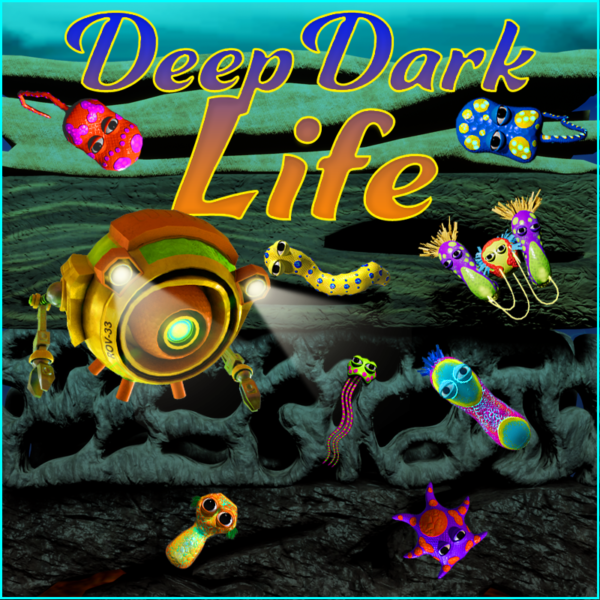 Deep Dark Life was developed by Ceisel & Associates with Patrice Ceisel, Barbara Becker and Matthew Board. A video of Deep Dark Life can be viewed at https://vimeo.com/264695298. The “Building Leadership in Science Communication” project was an education and outreach effort designed to build science communication skills and confidence among C-DEBI grantees, especially graduate students and postdoctoral fellows. Organized by the University of Rhode Island Graduate School of Oceanography’s Metcalf Institute for Marine & Environmental Reporting, a one-day workshop was held on October 17, 2016, in conjunction with the 2016 C-DEBI Annual Meeting in California to maximize the opportunity for C-DEBI grantee attendance. The workshop focused on providing expert instruction and coaching on how to develop a compelling message about scientific research for a variety of audiences, how to prepare for interactions with the news media, and how to develop and share videos of research activities for broader audiences. Of the 27 workshop participants, twenty completed a pre-workshop survey to assess their science communication experience, needs, and expectations, and sixteen completed a post-workshop survey to gauge the program’s effectiveness and impacts. The workshop was part of Metcalf Institute’s ongoing work to deepen public engagement with science through communication training for scientists and science training and resources for journalists. Funds are requested to design and construct a remotely operated vehicle (ROV) and benthic sensor platform, both with a working depth of 100 m, for marine research projects by community college and university students. Last year, a C-DEBI subaward enabled students at CSU Monterey Bay (CSUMB) to develop robust ROVs with joystick controls and HD video cameras in support of shallow-water K-12 education and outreach programs. This request builds on that earlier ROV design, but tailors capabilities to more advanced student projects by extending the working depth from 15 m to 100 m, adding a microbial sample collection system, and creating a ROV-deployable benthic sensor platform for habitat characterization. The increased depth will allow students to study marine life all the way from the surface down into the mysterious “Twilight Zone,” a relatively unexplored ocean layer beyond the reach of scuba divers that is characterized by significant gradients in light, temperature, oxygen, water motion and other biologically important parameters. The ROV, sampler, and sensor platform will support classes, student clubs, and individual student research projects at a community college and a 4-year university. All designs will be made freely available through the C-DEBI web site. This project supported an education, outreach, and communications (EOC) program during Atlantis/Jason expedition AT18-07 during June/July 2011. This EOC program complemented the scientific experiments begun during IODP Expeditions 301 (Summer 2004) and 327 (Summer 2010), and provided a longitudinal extension of EOC efforts begun during separate IODP expeditions that are of interest to C-DEBI. This project provided cross-cutting and robust education, outreach and communication support to the already-funded hydrogeologic experiments on the eastern flank of the Juan de Fuca Ridge. Using proven outreach methods, highly qualified and experienced educators, and full science personnel support, the project trained a core of educator/communicators to translate the transformative science emerging from this set of expeditions and build awareness, understanding and excitement around C-DEBI themes for students, educators and the general public. The project worked with 3 classroom teachers, one museum educator and one videographer to produce blogs, curricula and videos about the expedition science. In addition, the education staff conducted 13 live video broadcasts to shoreside audiences during the expedition, reaching about 300 students and educators. EOC specialists received training in interviewing and video production, and a variety of video products were created during the expedition. These included extended interviews and interview clips addressing common questions, overview presentations on expedition goals, videos about deep sea observatories and the C-DEBI STC, and a video from the R/V Atlantis to the Space Shuttle Atlantis during the latter's last mission. EOC educators also developed curricular materials based on AT18-07 goals and related topics. This project supported design and construction of remotely operated vehicles (ROVs) for project-based education and outreach activities. Although RETINA (a NASA project) and C-DEBI had already been using switch-controlled ROVs with 3 thrusters for E&O programs at Monterey and Catalina Island, those ROVs were difficult to control, required frequent repair, and were not easily adapted for scientific data collection. With this C-DEBI subaward, three students in the Ecosystem Electronics Lab at CSU Monterey Bay were hired to design and build six improved ROVs. Their new design -- dubbed the “Catalina” -- features: 1) greater reliability, 2) intuitive joystick control and a 4th thruster for better maneuverability, 3) lights and camera to record HD video for later analysis, and 4) attachment points for student-designed sensors or sampling tools. Each ROV is optimized for operation from a wharf or floating dock in seawater up to 15 m deep. Three are stationed at Catalina Island, where they are used in C-DEBI’s GEM summer course and other education/outreach programs. Three others support field trips for local classes (4th grade through college) and teacher training workshops in the Monterey area. One was used briefly for education activities in Micronesia. Over 300 students have used these 6 new ROVs in the past year. In addition, a more advanced ROV platform was developed for demonstration by RETINA and/or C-DEBI. This more advanced ROV remains with the Ecosystem Electronics Lab and serves as a test bed for evaluating the feasibility and educational benefits of other potential ROV upgrades.